Patterns were used to cover architectural surfaces since ancient times. They have been deployed as decorative elements to accentuate certain features and to communicate meaning and style. Over the last two decades, the digital revolution instigated new typologies of architectural skins and patterns. Patterns started to acquire a new role in the architectural form, moving beyond their historical symbolic decorative role into spatial devices; correlating with form structural and environmental properties. The workshop will explore this paradigm shift of the function of patterns from being decorative additive elements, into performative integral ones with architectural and technical functions for daylight modulation, temperature control, space enclosure, and others. 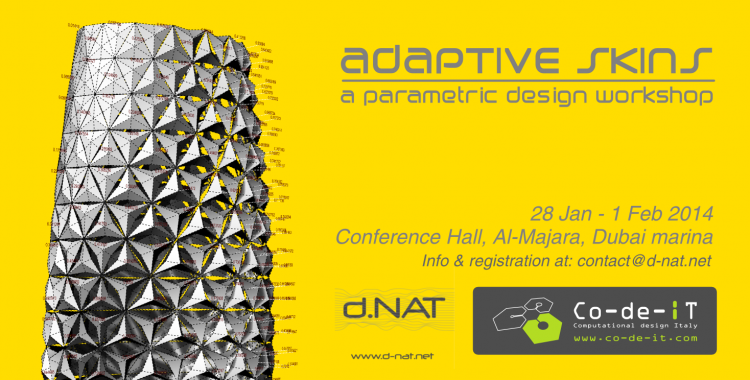 The workshop will introduce the participants to parametric design techniques as a new medium for architectural design. After covering few exercises on the logic and the principles of this design medium, we will apply the learned techniques on a selected project’s design exercise on a particular site in Dubai. We will be analyzing the forces affecting that site, developing data-sets for the force field, and mapping these data on the building form to generate a synthesis of form, pattern, and skin. The parametric design exercise aims to explore context-specific forms and patterns based on a feedback loop and negotiations between the relevant forces and the participant’s aesthetic sensibility. Throughout the use of visual scripting with Grasshopper (Generative modeling plug-in for Rhinoceros), participants will learn how to build and manage parametric data structures (from basic simple lists to complex data trees) and to develop data driven responsive geometry and envelops. Geometry and building skins will be evolved in response to context-specific database that can be selected from a manifold of information such as environmental analysis, orientation, views, and others. The aim of the workshop is to explore new design possibilities and to expand the design space towards performance-oriented design. In addition to the technical part, the workshop will also include two lectures on the subject of “inFORMation” by Andrea Graziano, and “Performative Skins” by Zayad Motlib and Raya Ani. – Advanced exercise: Analysis of specific site environmental data to develop a data set and generate an architectural envelop with responsive features driven by the data-set conditions. Basic modeling skill in Rhino is required. Participants should bring their own laptop with pre-installed software (software download links will be given after subscription). Andrea Graziano – Co-de-iT (GH & design tutors). Zayad Motlib + Raya Ani – d-NAT (GH & design tutors). On the afternoon session of fifth day, we will have a presentation and a review for all the developed projects. * students, teachers, researchers & PhD (proof of status required). The deadline for registration is 20/01/2014. The workshop has 20 places available and will be activated with a minimum number of 13 participants. But why do you have to copy so obviously other people’s work? in this specific case your Al Bahr tower was not used for a project, rather we will take it as a specific case study in the workshop we will do in Dubai. We do not intend to copy any work from anyone (as you can see by the rest of our website and the works we do); using examples from built projects in the workshops is a way to give participants further elements to grasp specific concepts of the tools they are learning and their potential applications. It was also nice to study your project while reproducing it in GH and while doing so we came up with a custom user object to spped up folding simulation that we are about to publish in the Grasshopper website. In the rush of the workshop advertising (we were invited on very short notice) we forgot to caption the image with the reference to the specific case study, I’ve just added it.